Here’s our GW16 fantasy football tips article where Andrew Ferguson reviews his GW15 teams in FPL, TFF, Sky and Sun and outlines his plans for GW16. Andrew finished top 1k in TFF, Sky and FPL plus 15k in Sun in 17/18. A really good week where most things went right for me including the benchings although I didn’t expect Salah to be benched I must say. Patricio is a worry but I have more pressing concerns as below but Fraser and Richarlison again proved their incredible value along with Kane bagging a double return as cap. My two Wolves players came off the bench for Balbuena and Robertson who I expect to be fit for the weekend so all in all a good gameweek. 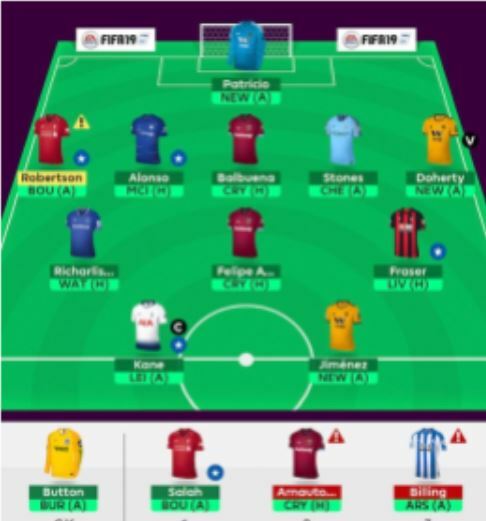 My plan was to swap Salah and Arnautovic to Sterling and Aubameyang for a hit which the decision looking easier by Arnautovic getting injured until the New Year. Salah continually flatters to deceive and will continue to have his minutes managed; an average of 6 points/million from a 13m player is not for me. I will be pleased to get Sterling in who is a frightening player not to own and Aubameyang looks like he may be about to explode and is a good rotation captaincy option this weekend before rotating well with Kane. The only potential issue this weekend is his minutes as he has played 180 mins this week. I am then looking at Alexander-Arnold from next week. The team below will change and isn’t my final team. At the moment if I get Aubameyang in, which is likely, it will be him. If not probably Kane. A team shake up to set me up for the coming weeks and nice rank climb. Doherty is proving good value from an attacking perspective with the City mids and Kane coming in to beef up my attack and starting well. I was disappointed Andersen didn’t get anything with three West Ham goals but they have great fixtures and is a great cheap option going forward. My defence was a mess but as they are all highly owned it didn’t matter. I am pretty settled now for the next few weeks and hope to get into the New Year with 20+ transfers left. My tip would be as there will be rotation, stick to your team throughout the Xmas period, injury aside. It is so easy to use 5-10 transfers chasing around benched players with little benefit which could be used far more effectively later in the season when teams have 3-0’s and the like. 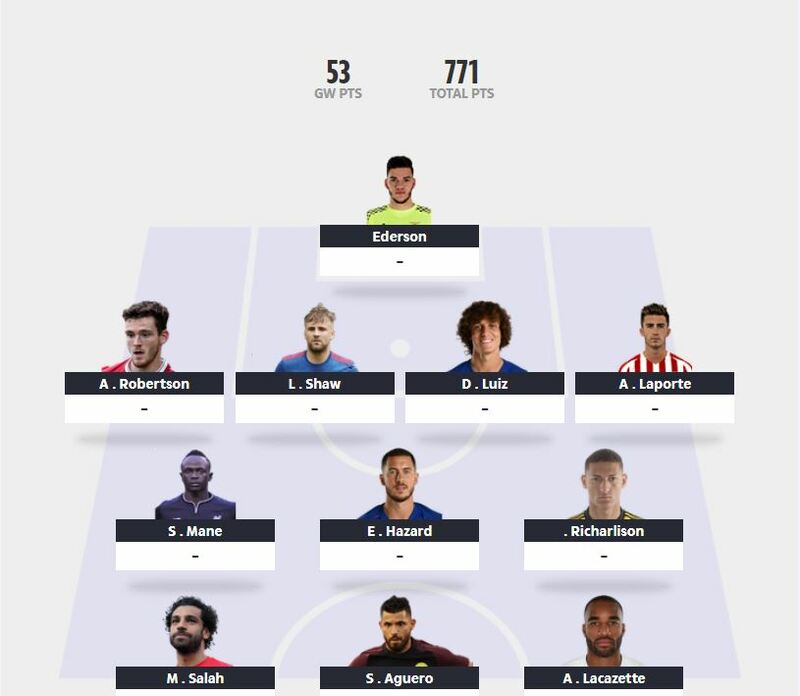 Another good gameweek with one final transfer used to settle my team down for the coming weeks with Salah to Kane. 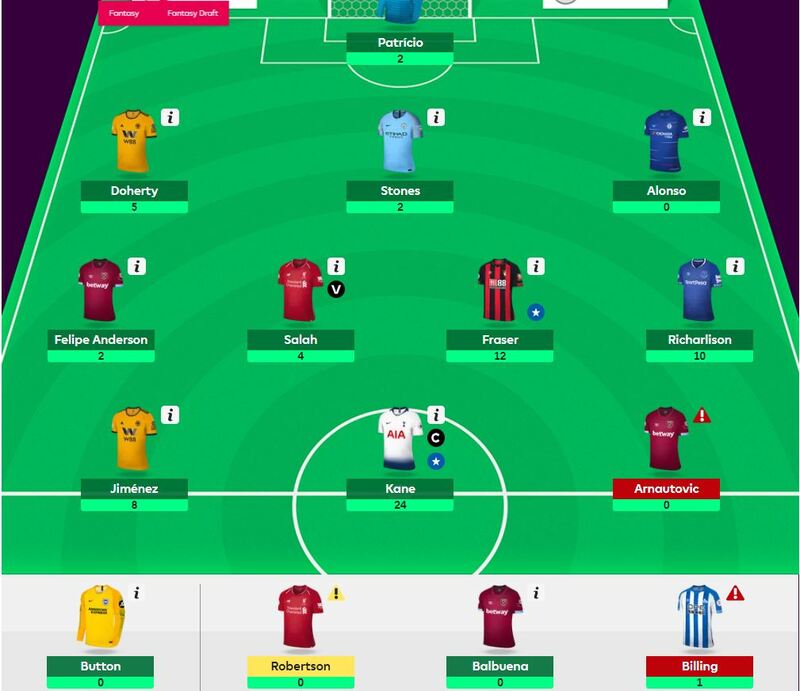 Again the mid-price talisman mids delivered ably supported by my premium defenders and premium mids/attackers to deliver my best score of the season by far and propel up the rankings to dizzy heights. Aubameyang is the only player I really want who I don’t own but I’m around 0.5m short of a Hazard to Aubameyang switch; Robertson to Alexander-Arnold would release the funds however. I will let the next couple of games play out and maybe an injury/switch opportunity will present itself to make that double transfer. Captains this weekend will likely be Kane, Vinagre and Richarlison. The nightmare continues and I need to do something to stop the rot. My defence has improved with Luiz, the City players and Robertson doing well over the last couple of weeks but my attack is diminished with Salah and Aguero looking overpriced, particularly with significant rotation upon us. Richarlison and Lacazette look good options at their price going forwards. Thankfully we get our December transfers on Friday so I will likely ship Mane, Salah and Aguero for Kane, Sterling/Sane and Aubameyang. Double Arsenal attack is risky but they have some great fixtures coming up, are playing well and I need to do something different. Hopefully I can catch a break and get back to some respectability by the New Year. 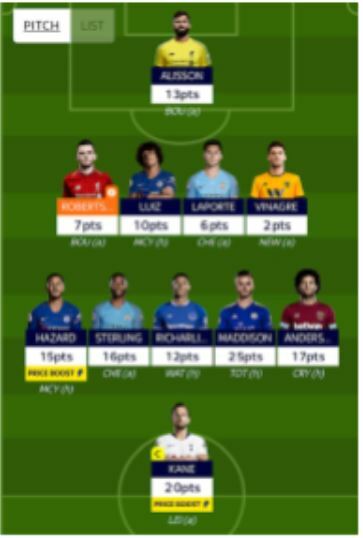 A good gameweek with the budget Jiminez getting some points and Sane getting off to a good start. Van Dijk is proving tremendous value and I am very pleased with the team going forwards. I will likely do Salah to Kane and will look at how to get in Aubameyang/Lacazette maybe via Hazard. 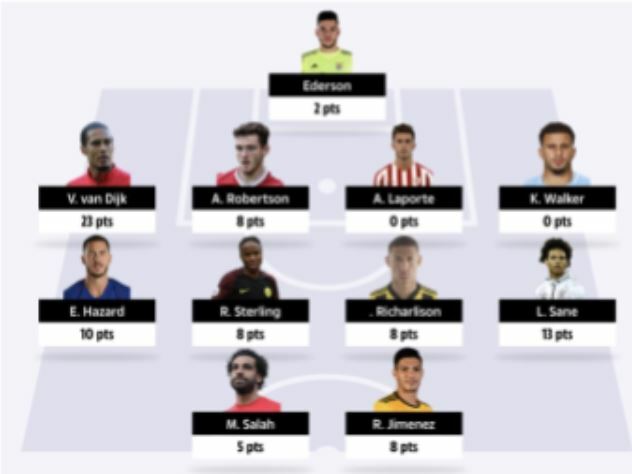 Good luck everyone for GW16! How do you have time to do all these formats?! 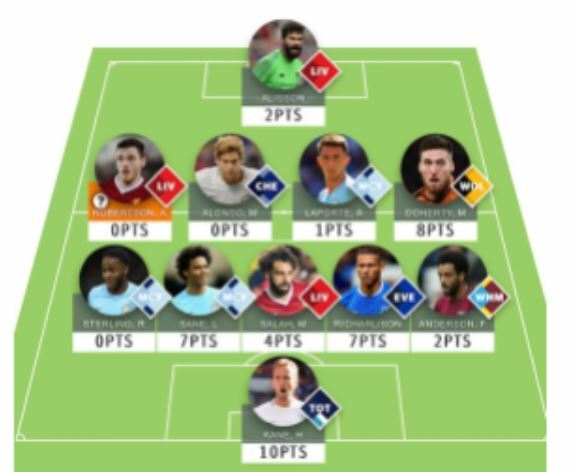 FPL takes enough effort I don’t know how you can be arsed with doing all those others too lol.